These Vintage Wire wheels feature a 56 stainless spoke Lip-lace design that allows deep backspacing to avoid clearance issues. The outer rim is finished in a bright show quality chrome finish. 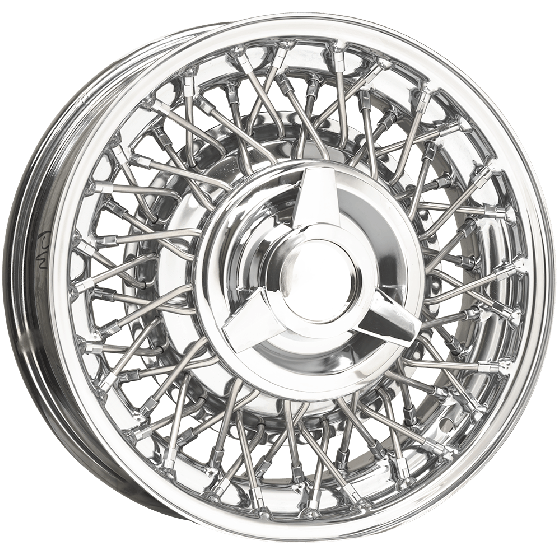 Perfect for 1955-58 Chevrolet cars with or without fender skirts, or any one who wants the look of the Thunderbird Wire wheels, but have a larger bolt pattern. Choose from many Caps to complete a custom look (accessories sold separately). Classic Wire wheels are warranted for a period of three (3) years from date of purchase against defects in materials and workmanship excluding the finish. Made in USA! Do you have wire wheel for VW 4x130 four lugs bolt pattern? Yes, the OE VW wheel has this bolt pattern, as listed here. For a 1959 corvette, would classic chevy wire wheel fit, and possibly allow for future disc brake conversion? We will need more information in order to advise you. Please contact us at 1-800-251-6336, or support@coker.com. Is the Vintage Wire wheel require a tube and would it fit on a 1977 ford thunderbird? This wheel does require a tube but is not recommended for a 1977 model Ford Thunderbird.